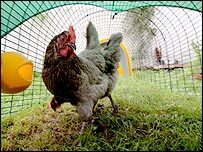 Urban dwellers across the land are being encouraged to get in touch with nature by keeping hens in their back gardens. But does it make sense - and what do the chickens think about it? With Tango... or is it Cha Cha? How practical is it to keep two hens in the small patch of green most townies have at their disposal? What about the foxes? Two days into my life as an urban hen wrangler and there's no doubt about it, I am being told off by a chicken. Every time I go into the garden her clucking takes on an accusatory tone and she approaches the end of the run and fixes me with a beady glare. It is evident that she wants to be let out to roam around the apparently thrilling habitat that is my garden but I have been told to keep her and her friend in the run for the first few days so they don't try to "home" to Oxfordshire. This feisty madam, whom I have named Tango, and her pal Cha Cha are my charges for the next few weeks. They are beautiful South American Araucana hens which lay pale blue eggs. 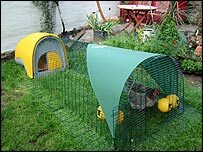 And, as befits such funky chickens, they have eschewed a wood and wire coop for an eglu - an iMac-style bright plastic hen house complete with run, feeders and a sun/rain shade. 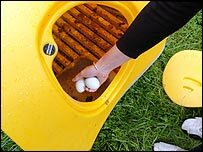 It has an "eggport" so humans can access the minimalist nestbox (urban hens don't do straw) and an easy-to-clean droppings tray - meaning for an extra green halo you can brush the guano straight into your compost bin. "We had a hunch that a lot of people wanted to keep hens but didn't know how," says Johannes Paul, 25, one of the inventors. "They think they need a massive garden and that there will be lots of mess and noise but that's not the case. The eglu and run are billed as fox-proof but foxes are very active in this part of west London and I was convinced that I would return from work on my first day to find a mass of bloodied feathers blowing around the garden. Fortunately my ladies were still scratching contentedly in the lawn, but I do not yet subscribe to the theory that hens are stress relievers - I have slept rather badly since they arrived. On the third night, I was awoken by a fox howling at 2am and a noise which sounded not unlike paws on plastic. I leapt out of bed like Farmer Giles and if I had had a shotgun I would have grabbed it. The garden was quiet but the morning revealed two footprints on the eglu roof - the foxes have definitely noticed the chickens are there. "Tom, just go and pee in the garden to put the foxes off"
Apparently one method of putting off predators is for the man of the house to pee around the garden - but I fear the foxes would not be the only ones to turn their noses up at this. A couple of days later the hens were still unmolested and I was still getting my morning telling-off from Tango so I decided to give them a run out in the garden. There was a lot of pecking and scratching in a newly-seeded flower bed, followed by digging a big hole in the lawn and then they settled down for a dust bath in the gravel path. Most of the time however they just wandered around together, eating plants and clucking affably. Hens don't make a lot of noise but smell is fairly high up on a would-be chicken-keeper's worry list. With city plots crammed together, the last thing you want to do is invade next door's patio with the delicate whiff of poultry-poop. At very close quarters, it has to be said, hens do pong a bit. But volunteers who spent months testing the prototype coops say neighbours can be placated by the other product to come out of a hen's rear end. "My neighbours were worried about smell and vermin," says Peta Brown, 50, from Brackley, Northamptonshire. "But they were won over once the eggs started coming. Sometimes I feel we are supplying the whole neighbourhood with eggs." And that's something I may have to embark on soon too. Tango and Cha Cha lay an egg apiece most days and wonderful though they are - with deep yellow yolks from all the grass they eat - they are starting to pile up. I must admit to feeling there is something of the tooth fairy about eggs appearing each day, as if by magic - which probably shows my life-long townie credentials. According to Johannes I am not alone. "People who keep chickens find that they are thinking about things that never really occurred to them before - about where their food comes from. "They begin to distrust food from a supermarket and they also do more baking because they have the eggs." 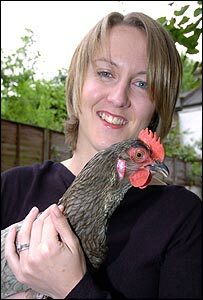 Francine Raymond, author of Keeping a Few Hens in Your Garden, agrees that concern over food has been a big factor in the recent boom in poultry-keeping but says there are also other influences at work. "Older people remember them from their childhood and there is a lot of nostalgia involved in the idea of retiring to the good life in the countryside," she says. "If I go into a garden where there aren't hens I feel there is something missing. It's two-dimensional - no colour, movement and drama." Others cite the influence of Channel 4's Big Brother, acquainting a new generation with the simple pleasures of keeping a few daft-as-brush chooks roaming around. Online bookseller Amazon UK has seen a 400% increase in sales across hen-keeping titles since 2000, something the company attributes to the reality TV show. But whatever the social psychology behind the poultry-keeping boom, a universal truth about chickens is they can't help but make you smile. The garden will be a neater place when Tango and Cha Cha have gone but it will also be duller without my little madams strutting about. "Chickens can be a bit noisy"